This is the window for parents of pupil . For a description of the buttons please scroll down. : Clicking this menu have option to set specific data like course,address,career overview,his previous school etc. : Clicking this menu have option view and edit forms. : You are in parent's window only. : It will open a window for information about school history . : It will open a window for to add dynamic fields to pupils . : It will open a window for writing remark about the pupil. : It will open the window for entering information about pupils legal guardian. : You can delete some information about the parent. : You can add additional information about the both parents. : You can browse details of previous pupil. : You can browse details of Next pupil. : You can make changes in information about pupil. : It will open a window for searching the pupil. 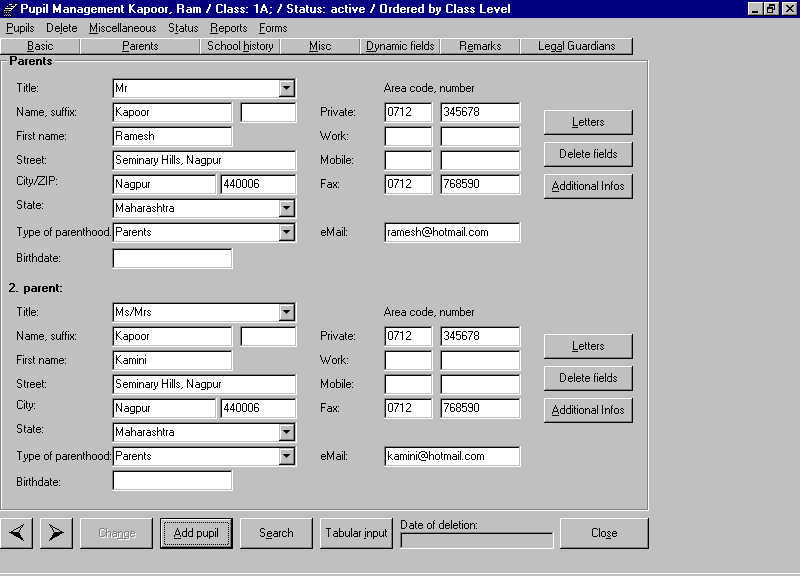 : It will open the window for entering pupil's data in tabular manner. : It will close the window and return to main window.